A new module is in the works: The Withered Crag. For low-level characters. Hopefully in time for NTRPGCon in June. Here's the back cover art by Alex Zisch. Unlike the earlier covers that cover your creative content, this covers the boring-but-necessary-for-some-projects details on how to deploy the Open Game License in your project. Note: This does not cover whether to publish using the Open Game License (not every project needs to), nor the consequences & limitations (there are many!) of publishing using the OGL. This is only about HOW to deploy the OGL correctly, for when you want to or need to. In other words, your published project needs to somewhere say “Open Game Content may only be Used under and in terms of” the OGL. You don’t have to use that exact quote though. The Hyqeuous Vaults contains Open Game Content, as defined in the Open Game License, below. Open Game Content may only be Used under and in terms of the Open Game License. In other words, you must paste the entire text of the OGL into your project. On page 16 of The Hyqueous Vaults, you’ll find the entire Open Game License, following the text that was added for Step 1. First, if you Use (as defined in the OGL) any Open Content from other item published using the OGL, you must copy the Section 15 details from the other item, and put them into your own Section 15. Do this for every such item you Use. If you Use five other OGL-based items, you’ll have a lot of copying to do. If multiple Used items all have an identical line in their Section 15 (they all have this line, for example: “Open Game License v 1.0 Copyright 2000, Wizards of the Coast, Inc.”), you only need to include that line once in yours. Second, you need to add a line to your Section 15 with the copyright info for your own project. The Hyqueous Vaults, for example, Uses content from OSRIC, and the Sandman from the Tome of Horrors Complete. So I needed to copy Section 15 info from OSRIC, as well as the Section 15 info from the relevant parts of the Tome of Horrors Complete (which has some special instructions for how to reference individual monsters therefrom). Those sources’ Section 15s had lines for the System Reference Document and a couple Swords & Wizardry books, I copied those into my Section 15 too. Finally, I added a copyright line for The Hyqueous Vaults itself. Swords & Wizardry Complete Rulebook. Copyright 2010, Matthew J. Finch. Sandman from the Tome of Horrors Complete, Copyright 2011, Necromancer Games, Inc., published and distributed by Frog God Games; Author Scott Greene, based on original material by Roger Musson. The Hyqueous Vaults Copyright 2017, Hyqueous Vaults Creation Team. This means you need to add text that allows somebody else to understand what parts of your project are Open Game Content, so they can—in turn—use it in their own projects. You can do this many ways, from a text description of what is Open Game Content, to using boxes around or colors behind Open Game Content, to anything else, so long as it's clear. 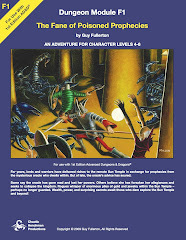 The following is Open Game Content, except as excluded by the Designation of Product Identity below: Spells, magic items (excluding whispering tome), creature statistics, the complete new monster entries for ur-ameboid, eel-man, sandman, and vodyanoy, and the complete new magic item entries for spectral candle, prime rod, shroud of the water striders, pointing key, thrice-blasting ring, and blossoming quffa. Everything not designed as Open Game Content is Product Identity, including, but not limited to, artwork, maps, logos, layout, formatting, and the names The Hyqueous Vaults, Hyqueous Vaults Creation Team, Zirrind, Redbeck, Emanreh, and OSRIC. Strictly speaking, I didn’t need to designate what was Product Identity; the OGL doesn’t require you to that, and in fact has a pretty thorough definition of Product Identity already. But lots of publishers designate it anyway, because it allows them to clearly indicate what stuff is off-limits to people who want to otherwise Use some of the Open Game Content. It is not sufficient to just paste it in the unmodified Open Game License and call it done; you always have to modify Section 15, include a notice, and include a designation of Open Game Content. I have seen people simply not bother to read the OGL, and thus deploy it incorrectly, leaving themselves in breach of the license. Yes—the OGL is a legal license, so if you plan to agree to it, you should also read it! For more details on the OGL, see Matt Finch’s OGL video series (starting with part one here), and Rob Conley’s OGL Primer (and be sure to read the comments, where I outline some consequences he missed). 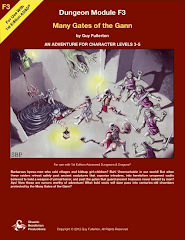 21 pregenerated characters, nicely formatted and ready-to-print, from levels 3-8, with details down to encumbrance totals! Grab it from the product detail page here (or click one of the Motley Jerks cover images). 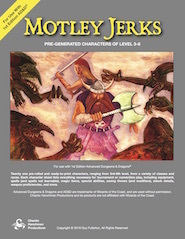 Want even more free pregens for your old school game? 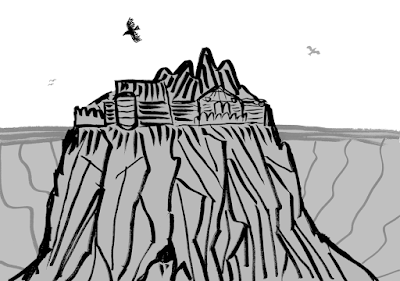 Check out the Pregenerated Character Library on Unvisible Citadel. 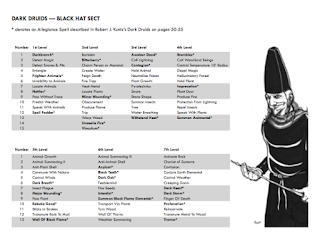 If you already have Robert J. Kuntz's Dark Druids, check out the errata and bonus pdf below. If you want to get it, check out the ordering links on the main Dark Druids page. Many Gates of the Gann and The Fane of Poisoned Prophecies pdfs are now available via Tabletop Library, who is having a 25% off Grand Re-opening sale (use coupon code GRAND-25 at checkout). 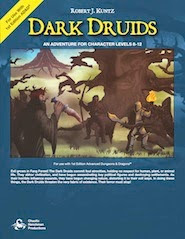 Dark Druids and the other two modules print versions are 18% off at Noble Knight Games, thanks to their current sale. Copies of Dark Druids are once again available for sale directly from CHP, and more should be headed to Black Blade Publishing and Noble Knight Games in the next few days. Check out the two most recent Dark Druids reviews; admittedly these are from about six months ago, but they still go into great detail about the module. James Holloway posted an extensive review of Dark Druids on his blog. Go check it out! If you're curious what the physical module looks like, his review has some useful pictures, including some interior details. Full disclosure: James is a friend, and I have gamed with him. I don't think his review is biased, but I wanted to mention that anyway.